The provision of electricity in Chile is heavily dependent on foreign countries, particularly Argentina. Recently, important restrictions on natural gas exports from its neighbour together with an increase of domestic consumption has led the Chilean government to promote unconventional renewable energy (energía renovable no convencional - ERNC). The Los Rios region is strategic for the state energy program; in the municipality of Panguipulli alone, around 10% of the national hydroelectric capacity is planned to be installed. At least six hydropower projects are in the works by the Spanish company ENDESA and its new owner, the Italian company ENEL, along with Sn Power (Norway) in the region of Los Rios. One of them will be built on the lake Neltume and will be carried out in three phases: the excavation of the diversion tunnel, the hydropower plant and the transmission lines. Up to now, only the first one has been cleared, while the other two are waiting for the EIA. The power plant would make use of the waters of the Fuy River and empty into Lake Neltume (406 m jump), raising the lake’s level and also the temperature of the water. The project is in violation of the articles 2 and 7 of the OIL convention and the communities Inalafken, the regional indigenous Koz Koz parliament and the Mapuche organization Meli Wixan Mapu claim control over the local natural resources, water included. The site is sacred for them, as it's a land where they perform important rituals and religious ceremonies and have cemeteries. Five Mapuche communities are opposed to the plant’s construction, although a group in the community of Juan Quintumán supports it; Endesa-Enel has reportedly given them money, construction materials for housing repairs, and livestock and feed. In March 2013, the company tried to negotiate with the local Koz-Koz mapuche community in order to get their approval to go ahead with the contruction. Jorge Weke (also spelled “Hueque”)–the werkén (spokesperson) for the local Koz Koz Parliament rejected the dialogue offer. The consortium tried unsuccessfully to get approval for the project in February 2010 and again in December 2010, but there has still been no official decision on the plant. 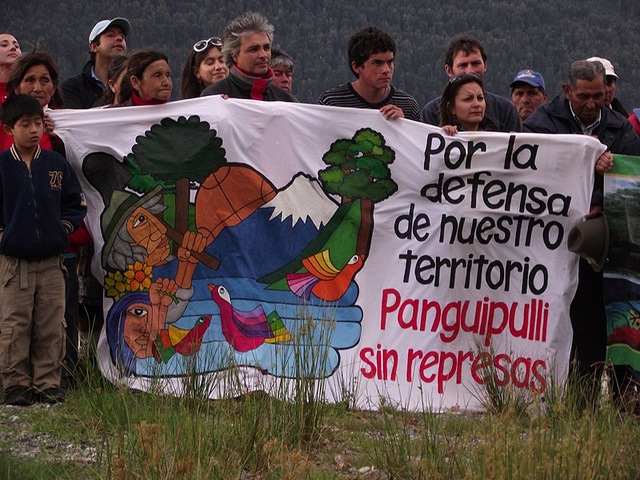 (Tierramérica-IPS 2/11/13 via Unrepresented Nations and Peoples Organization (UNPO); Radio Bío Bío (Chile) 3/2/13) Actions against the project have been carried out both in Chile and in Spain, but also in Italy, as Enel bought Endesa in 2009. In April 2012 communities affected by ENEL projects in Latin America, Russia, Bulgaria and in Italy joined together to put pressure inside and outside the General Assembly of shareholders in Rome. Through activist shareholding with Rome-based NGOs (Fondazione Banca Etica and Re:Common), representatives of Mapuche communities participated in the shareholders meeting and had some minutes to denounce in front of all shareholders and the international press the impacts in the area and to urge for a rapid change of energy policy and of the company strategic plan for future projects Their demands were to scrap unsustainable and harmful projects like coal plants and large hydropower plants and to change ENEL's strategic plan towards a small scale energy model. After the recent elections in Chile, indigenous Mapuche communities have demanded the new government to change harmful energy planning in Chile and recognize communities' dignity in their lands and the right to live according to the “Kümey mongen”, the local word used for "Buen vivir" or "Good life". These kind of projects are not new to the region. A dam operated by ENDESA, for example, was constructed in 1962 and is today operated by ENEL (after it bought Endesa in 2009) and while a small royalty is paid to the municipality, the local people have never received any compensation, despite the loss of 300 ha of land. El proyecto contempla la construcción de una bocatoma para captar las aguas del río Fuy, destinada a captar un caudal máximo de 140 m3/s, a aproximadamente 980 m. aguas abajo del nacimiento del río Fuy, las que luego serían conducidas mediante una obra de aducción subterránea, de aproximadamente 10 kilómetros de longitud, hasta la caverna de máquinas, la que sería también subterránea . The energy produced by the plant will be directed to the Central Energy Grid (Interconectado Central). Italian NOGs and a foundation have participated for some years in the General Assembly of shareholders of ENEL, in order to denounce the impacts and push for a change in the company's energy strategy. Local communities have also had "mesas de dialogo" with the company. Other All impacts are potential because the plant is not built yet. If constructed, all such impacts will surely occur. Development of Alternatives The local communities question the alleged need of energy of the country. They denounce the "terror politics" implied by the company in term of energy emergency and the need to generate more. They call for a "Consulta previa, libre, informada y de buena fé". They also want to have the area suited for tourism activities and bring revenues for the local people. Why? Explain briefly. The population has mobilized and strengthened cooperation with national and international NGOs. Still, the project is still under negotiation and the government and company have not changed any plan. Links to various articles and materials at the bottom: "Por conflicto Endesa: Emplazan al Estado Español a respetar Derechos Indígenas en América Latina"
Central Neltume ¿un nuevo Ralco? 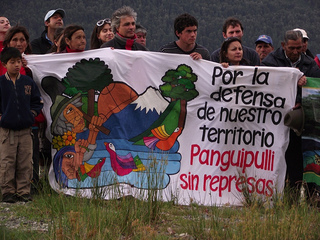 Cancion rap en favor de la campanya contra la represa "Patagonia sin represas, Panguipulli"
Other Comments The plant in Panguipulli requires the construction of a transmission line (Línea de alta tensión Neltume-Pullinque), which has also generated conflicts. The INDH map reports about that .